(CNN) - With four months to go until the midterm elections, the Democratic senator in a crucial contest that could decide the balance of power in the Senate, has just over $5 million in her campaign warchest. Democratic Sen. Jeanne Shaheen of New Hampshire's re-election campaign announced Monday that it had $5.1 million cash on hand. And they reported that the senator raised more than $2.8 million the past three months, bringing to more than $10 million she's brought in this cycle. The campaign said Shaheen received donations from more than 31,000 contributors, up nearly 5,000 from the first three months of the year. "Senator Shaheen is proud to have such strong grassroots support for her campaign and her work to put New Hampshire first and make a difference for the people who live and work here," said Harrell Kirstein, Shaheen campaign spokesman, in a statement. Last Monday, the final day of the second quarter, Shaheen got an assist from Democratic Sen. Elizabeth Warren of neighboring Massachusetts, as the progressive rock star hosted a fundraiser for Shaheen in Boston. Republicans, who need to win back six Democratic held seats this November to recapture the Senate, view Shaheen – a former New Hampshire governor – as vulnerable as she runs for a second term in office. 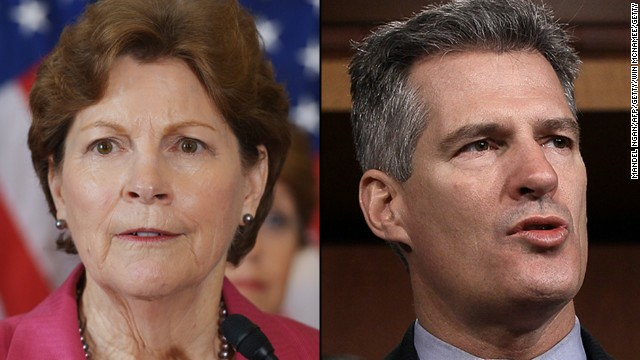 Last week the campaign of former Sen. Scott Brown of Massachusetts, who is considered the frontrunner among the Republican candidates hoping to challenge Shaheen this November, announced that it raised more than two million from April through June, his first full quarter as a Senate candidate. Brown's campaign didn't say how much money it has in the bank. The Brown campaign is confident they can keep pace with the incumbent. "It’s clear that both campaigns are going to have the resources they need to get their messages out. That won’t be a problem for anyone in this election. Senator Shaheen’s problem is her message. Voting 99 percent of the time with President Obama is not a winning formula in New Hampshire in 2014," said Elizabeth Guyton, Communications Director, in a statement Monday. The Brown campaign revealed their campaign cash figures one day before the candidate was formally endorsed by 2012 GOP presidential nominee Mitt Romney at a high profile event at the site near the New Hampshire seacoast where just over three years ago the former Massachusetts governor officially launched his second bid for the White House. Monday the Brown campaign released a video of that event, which includes clips of both Romney and Brown, as well as sound from supporters at the event. "We feel he is our best Republican to win this race and bring a Republican majority to the U.S. Senate, one of the supporters in the video said of Brown. A poll released last month indicated Brown was the clear frontrunner in the September 9 GOP primary. That survey, and another recent poll, also indicated Brown trailing Shaheen in a November showdown by 10 to 12 percentage points. Brown, then a little-known state senator, in Massachusetts, scored an upset victory in a special election in January 2010 to serve the final three years of the term of the late Democratic Sen. Ted Kennedy, who had died the previous summer. Brown lost his bid 2012 re-election bid for a full six-year term to Warren. At the end of last year, Brown sold his home in the Bay State and moved his residency north to New Hampshire, where he owed a vacation home and where he spent much of his childhood. In April he formally launched his Senate bid in the Granite State. It could be seen as Scott Brown being a carpet bagger. Either that or he is trying to be one of those few people who represented more than one state in the US Senate. I don't think that either reason is a good one to elect Mr. Brown to the US Senate. I'd really be surprised if voters in New Hampshire buy into Scott Brown's schtick. Brown is just as rootless as Mr. Romney, or the 2nd generation Cheneys. They just feel they should be elected because they want it- and their home state, their roots (or lack thereof) shouldn't matter. Corporations are people my friend. They can exercise Free Speech by giving Millions of $ to their Candidate or Cause. They can have "Deeply Held" Religious Beliefs. Scott Brown wasn't any good as Senator in 2010, and he won't be any better in 2014. I'm so glad Elizabeth Warren beat him in 2012, and I hope Jeanne Shaheen beats him this time around. Maybe Mr Brown will give up and go do something he's more qualified for. And here I thought there wasn't a person alive that could possibly look any sleazier than Ted Cruz. Scott Brown has proven me wrong. – the open border policy from the Democratic Party that is allowing tens of thousands of illegal immigrants to flood into the USA. – the foreign policy from the Democratic Party that has the Middle East a blaze. – the economy policies from the Democratic Party that has 50 plus people on food stamps. – the job policies from the Democratic Party that has the lowest number of people working in the USA since the Great Depression. The latest job number; 288;000 job created (waiting to be revised) 674;000 people fall off the job rolls. New Hampshire is not going to elect this right wing tool to be their Senator. All the righties need to get their heads out of the clouds and deal with reality... they will NOT be winning the Senate. Not this election, or next election, nor any forseeable election. Quit running right wing tools and run a sensible candidate with sensible ideas and maybe.... but your party, right now... it's whack. All of our politicians are for sale. Money-grubbing has destroyed the U.S.
-try reading the law that GWBush signed. It says that we cannot expel minors, and that we must shelter them until their nearest relative is found. -You can count investors like Mitt Romney as part of the non-working demographic. Without extended unemployment benefits, then there are fewer folks reporting themselves as unemployed. -what failed health care policies? millions of more people have health insurance who never had it before. It's a success, so much so that Republicans have stopped talking about it. Wanna why? Because repealing the ACA at this point in time would mean that Republicans would be taking health care away from millions of people. BTW, it has mostly been the folks in the red states that have seen the worst of it, mostly because not expanding Medicaid has meant less competition which means higher prices for a product that is in high demand. S.B says Scott Brown could be seen as a Carpetbagger. Um, Sorry. Hillary Clinton was a Carpetbagger. J. Rockefeller, West Virginia Senator, is a Carpetbagger. Robert Kennedy, former Senator, New York, a Carpetbagger. Most likely some fairly good candidates are headed to the bone yard in November. But you still have your Nanny! No, maybe not. Wow – this is an analogy for right wing morality. It shifts around as needed. First HobbyLobby supports the contraceptive industry, then, when convenient to fight the ACA, they suddenly convert to anti-contraceptive. "Quit running right wing tools and run a sensible candidate with sensible ideas and maybe...but your party, right now..it's whack." Which left wing policies make sense? Great ideas, but bankrupt on accountability, which is why you rely on group-think. It's like getting a degree in philosophy and trying to do something bankable with it. Doesn't wortk. No more liberal policies for this one-time dem voter. Throwing money at a problem and crisis-capitalization are alll you got. 2-Indy – It seems you are hooked on unnecessary republican wars, unfunded republican drug programs, record republican job loss, stock market under 7000, voter suppression, and government shutdowns. Quite a republican badge of honor you wear. The vast majority of Americans describe themselves as middle of the road in political views but our rabid, bought and paid for politicians, keep dragging the country either to the extreme right or the extreme left. I had a Republican office holder tell me the other day he would vote for any candidate that would stand up and publicly say what he really believed in and stood for, but he had not heard that from any candidate for years. Who really cares about that nonsense? If a person meets an individual state's requirements, then that person is NOT a carpetbagger. Why are you always whining about your Nanny? Yuck. We cannot expel minors; close the border stop the Democratic Party that is allowing tens of thousands of illegal immigrants to flood into the USA. Look at the facts, those job losses were after the Democratic Party took over the House and Senate and started to implement the economy policies from the Democratic Party. You can subtract one for Mitt Romney as part of the non-working demographic. You still have to account for 50 million plus people on food stamps. The economy shrank 3 percent in the first quarter of 2014.
millions of more people have health insurance who HAVE NOT PAID FOR IT. The 8 million the Democratic Party claims have signed up is now being questioned and revised; so far down 2 million and still counting. I thought the candidates/opponents were a female and a male, not 2 males...? You right wingers have a truly distorted sense of the facts. -Republicans have no accountability. "Deficits don't matter" to them. I've yet to hear one of you condemn that remark. -Group think? Seriously? You're projecting. Your guys are the ones who sign pledges that condemn them to group think. Every listen to the Republicans doing their daily sound bites for the evening news. They all use the exact same phrases. "...keep dragging the country either to the extreme right or the extreme left." The right has succesfully done this time and time again all the while pulling the country further to the right, then lying about the center. Example.... Obama is a moderate Democrat at best, but to hear the incessant screaming from the right, one would think he was far left... he is not. Not even close. We keep getting jerked to the right by the propaganda network always working in full overdrive and the right wing activist SCOTUS (to hear righties, they are always against judicial activism, but to hear them cheer the 5 biggest judicial activists in the country, it strengthens the contention of their hypocrasy... like anyone doubted this!). So please... enough with the 'extreme left' crapola... any move to the left of these far right idealogues the taker states keep electing would be a move in an excellent direction. Wow... the only item you left out of your stale democratic talking point word salad was "Koch Brothers". Close, but no cigar. Let’s not forget the historic election in November 2006 where the Democrats won the control House and Senate for 2007 thur 2008! So I guess the 2 years of Harry Reid and Nancy Pelosi running congress had no impact on the economy. Oh I forgot the president write the laws; or; it seems that way now. I keep hearing the "red taker States" comment over and over which I believe is a bit over played. 1. I believe that study was done in 2004 (I may be mistaken) but that is 10 year old data still being circulated today as fact. 2. A lot of the "taking" comes from military spending (bases, contracts) and other government contracts. 3. Well....I won't comment on that one as it is not popular or well received among liberals.